As a company with a strong ambition towards a better future, IKEA has integrated sustainability into every aspect of its business, sourcing many of its raw materials from certified farms. 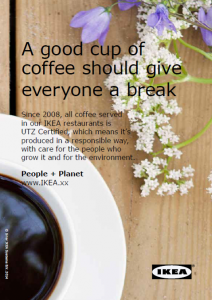 All of its coffee is UTZ certified and the company is committed to sourcing 100% UTZ certified cocoa in the IKEA chocolate range by 2015 and will be adding tea. IKEA engages consumers with its sustainability efforts by clearly communicating its choice for sustainable sourcing. UTZ caught up with Anders Lennartsson, Sustainability Manager for IKEA Food Services, to talk about why traceability matters and how being transparent has had a positive effect on business. IKEA, like UTZ, has a strong ambition towards a better future. Can you tell us a bit about why you decided to embark on that journey, and how it’s going? How is UTZ helping IKEA to achieve its sustainability goals? “Already in 2008 IKEA decided to only serve coffee that is responsibly produced and UTZ certified coffee was chosen. Since then we have also added UTZ certified cocoa in our chocolate bars and currently we are working towards UTZ certified tea. Both the coffee served and sold at IKEA and the cocoa in your chocolate bars is traceable. Why is that important to you? IKEA has invested a lot of time in employee and consumer communication about your choice for sustainable sourcing. Being transparent about what you are doing must have a positive effect on the company. Can you provide some insight into how that’s been for you? To learn more about IKEA’s sustainability journey, click here. Not really..I want to know in which country is the cocoa in IKEA chocolates coming from..
We love your coffee. it was a gift from a dear Friend of my wife. We are interested in buying your coffee by UPS or Fedex. Please E/mail us information about buying your products this way! Thanks for the info, they really help!